Yesterday was one of those days when the time I had planned for cooking and writing just sort of vaporized under the pressure of scheduling too much on a day off. If you follow this blog, you will observe that I often find myself pressed for time, but that I find cooking both recreational and restorative.) Still, yesterday I was short on time and had not been to the market. So I went foraging in the freezer and in the crisper drawer of the refrigerator and came out with frozen sock-eye salmon, parsnips, carrots, broccoli and a small chunk of havarti. It was way too hot for cooked veggies, and I didn’t feel like serving crudité, so I decided to make slaw. I’m glad I did! 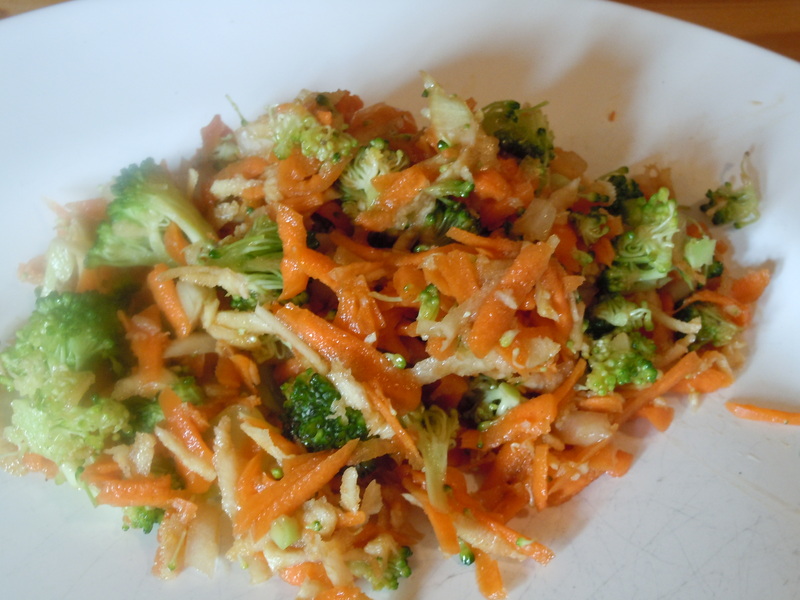 Grate the carrot and parsnip, and cut the broccoli into small florets. Add the onion. In a small bowl, combine the olive oil, vinegar, and honey. Pour over the vegetables and toss. Refrigerate or serve at once. If you are using the sesame seeds, add them just before serving.